Lyuba, a teacher in Moscow, has a hard time explaining Soviet history to her students—”a normal mind can’t comprehend it,” she says. Lyuba, together with the four other former classmates who are the subjects of Robin Hessman’s documentary, all lived through Communism as children. Then, as young adults, they experienced the upheavals of Perestroika (“restructuring”) and, in the early 90s, the dissolution of the Soviet Union and the end of the Cold War. Their childhoods, by all accounts, were idyllic. Of course many people are nostalgic about their childhood, especially when it was lived in “simpler”—we like to think—times. But times really were simpler in the USSR of the 70s and early 80s: there was little on TV, so kids played together and read; besides, the government kept them busy with “volunteer” activities such as Communist Clean-up Day and anti-war demonstrations. Their esprit de corps was nurtured by the system’s opposition to the common enemy: the USA. The only problem, says Ruslan, a rock musician who now lives “outside the system,” is that you couldn’t buy the music you wanted. Then suddenly everything changes: Mikhail Gorbachev, at 54 the youngest member of the Politburo, becomes Secretary General of the Communist Party. Jeans and chewing gum become available; hippies play music on the streets; the propaganda stops. 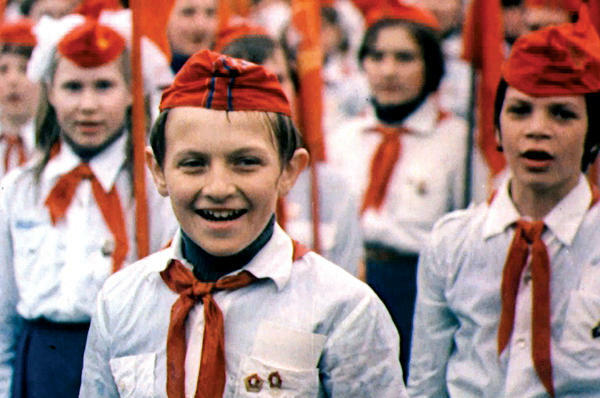 Young people feel free to quit the Komsomol, the almost-obligatory young people’s Communist organization. In 1991, Gorbachev is arrested, the masses demonstrate, foiling the coup; by year’s end, the Communist Party is banned, and the Soviet Union is officially dissolved. But corruption accompanies the new freedoms, and divisions between the haves and have-nots become more pronounced. Alone among the haves among Hessman’s five subjects is Andrei, manager of 17 Café Coton stores selling French shirts (about $150 to $160 each) and ties. Under Communism, he says, he could never have held the jobs he’s had. Andrei and his family live in a luxurious apartment; life is good. The others—Lyuba and her husband Borya, also a teacher; Olga, a single mother and employee of a billiard table company; and Ruslan, the rock musician—are less sanguine. Ruslan can’t understand how people’s values can have changed so. Olga is unhappy about the level of stress in today’s Russia. Borya talks about today’s kids being interested only in money and about election fraud. They’re all cynical about voting and about present-day Russian society. Maybe that’s why they all take comfort in cigarettes. American director/cinematographer Robin Hessman lived in Russia for years. Wisely, she’s avoided using “experts” or talking heads, instead relying on her five subjects, as well as documentary footage, old home movies, and old propaganda films directed at kids, to illustrate her theme: when one corrupt system is replaced by another, a new set of anxieties takes the place of the first. “My Perestroika” is currently playing at the Balboa Theatre in San Francisco.